What OneNote Triggers and Actions are Supported? 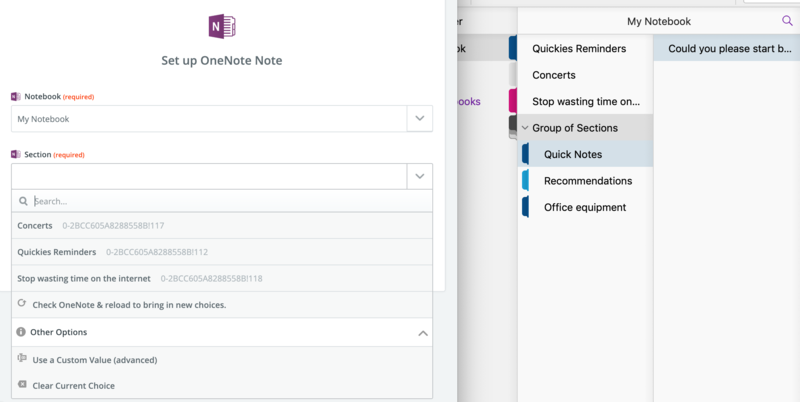 New Note in Section - Triggers when a new note is created in a notebook/section. Create Note - Create a new note in the "Quick Notes" section of your default notebook. Create Page/Note From Url Link - Given a URL, we'll download it and place it in your OneNote account! Append Note - Appends content to the end of a note. Create Image Note - Creates a note with an embedded image (must have a public URL to that image). Next we will ask you to give your new account a name or label, which is just a handy name for you to recognize within Zapier. It doesn't matter what you name it. Click "Continue" and a new window with OneNote will open, asking you to enter your username and password. After clicking "Sign In," OneNote will give authentication to integrate with Zapier. The window will close and you'll return to the Zap editor where you'll be shown that the "Account is working." From here, you'll be allowed to continue setting up your Zap. Here's how to add a To Do item (perhaps in an "Append Note" action) with checkboxes in OneNote. This can happen if you are using Section Groups. We can only see Sections that have not been placed in a Section Group. As you can see below, the 3 Sections I've put into a Section Group don't appear in Zapier.